as much a trial of his newfound interest in printmaking as it was an assertion to connect both to his dealer and to a great artist of the past. But because the work is a portrait, albeit one nearly 400 years removed from the original sitter, it inevitably sparks a dialogue about the nature of the genre. Indeed, several pictures in this exhibition are like Picasso’s—portraits of portraits. In using a portrait to begin a conversation with one’s creative predecessor, one necessarily engages the conventions attached to the genre. The result of this pictorial recycling, however, is an undermining of the purpose of portraiture, which, at its core, is a presentation of a sitter to his or her public. The intent shifts, and the focus on the sitter is exchanged for a consideration of the relationship between artists instead. In the late 1950s and early 1960s, Picasso produced a number of linocuts, including this interpretation of a portrait by Lucas Cranach, a 16th century German painter. Linocut is a relatively simple printing technique. A thin sheet of linoleum is affixed to a wooden block, and the artist carves out a design using sharp tools of varying shapes and thicknesses. The block is then inked and the print is made. Unlike etching and lithography, this technique doesn’t involve chemical processes or multiple steps to ready the image for printing. Conceptually, it’s very different, too. In other techniques, the ink adheres to marks made by the artist, but in linocut, the ink is applied to areas the artist has not touched. For this print, Picasso employed the traditional method of cutting a separate block for each color. This required careful alignment from one block to the next so that each layer would fit properly with those that had been printed before. 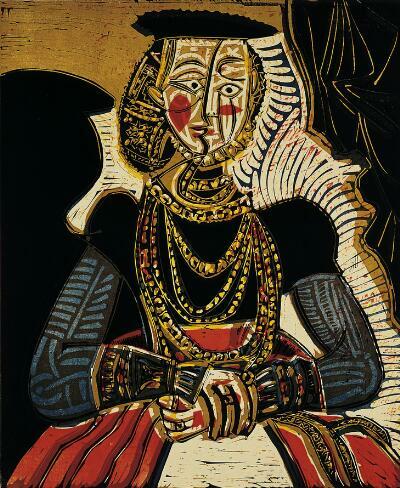 The layering also allowed Picasso to explore a variety of carving techniques to achieve a wide range of textures and patterns. In some areas, like the woman’s sleeves, wide cuts let the solid blue show through, indicating the pattern of the fabric. In others, like the background to the immediate right of the figure, Picasso has built up layers of texture with each succeeding color. This was not the first time Picasso had looked to Lucas Cranach for inspiration. In the late 1940s, he did a series of lithographs based on Cranach’s painting of the Old Testament story of David and Bathsheba.